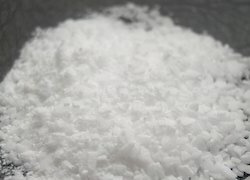 Wholesaler of a wide range of products which include stearic acid. In order to fulfill the ever changing demands of our clients, we have been engaged in offering a quality range of Stearic Acid or Fatty Acid. The offered acid is processed by expert professionals using high-quality herbs. Our range is processed in completely hygienic manner. This chemical is available in packs of different quantities. Stearic acid is also known as a hydrogenated fatty acid.